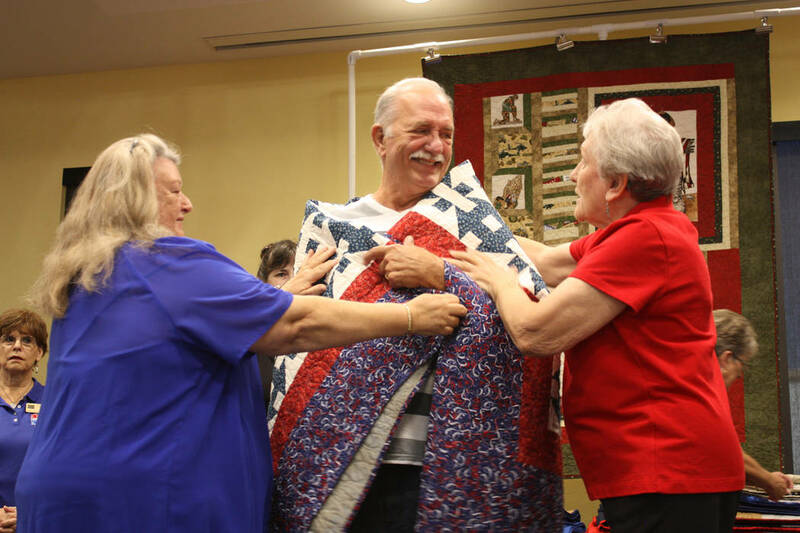 Robin Hebrock/Pahrump Valley Times Army veteran Douglas Wolf was wrapped in the warm and comforting embrace of his new quilt of valor, handmade by the Nye County Valor Quilters to honor his service to America. Robin Hebrock/Pahrump Valley Times Nye County Valor Quilters leader Elba Rocha welcomes the large crowd to the Nov. 3 quilts of valor presentation ceremony. 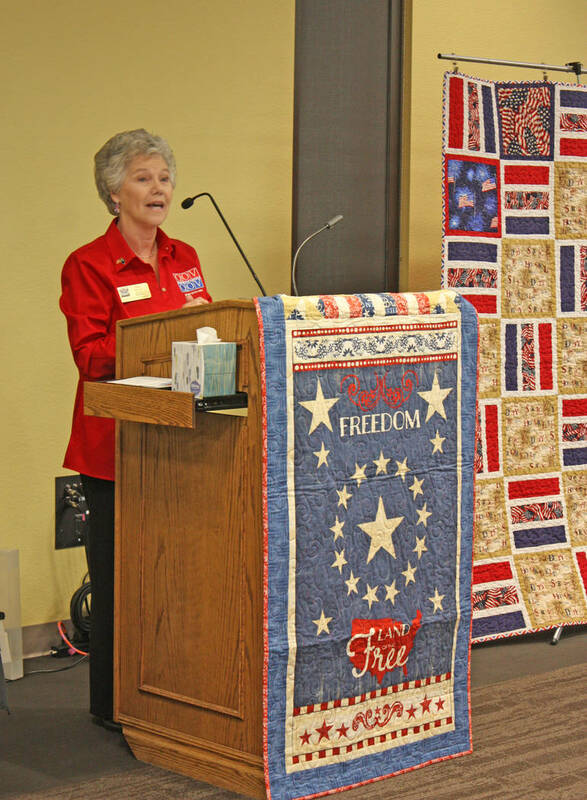 Robin Hebrock/Pahrump Valley Times Patriotism was in the air at the Nov. 3 quilts of valor award ceremony, with decorations to reflect the mood. Robin Hebrock/Pahrump Valley Times The Marine Corps League Honor Guard presented the colors to kick off the Nye County Valor Quilters' latest quilt ceremony. 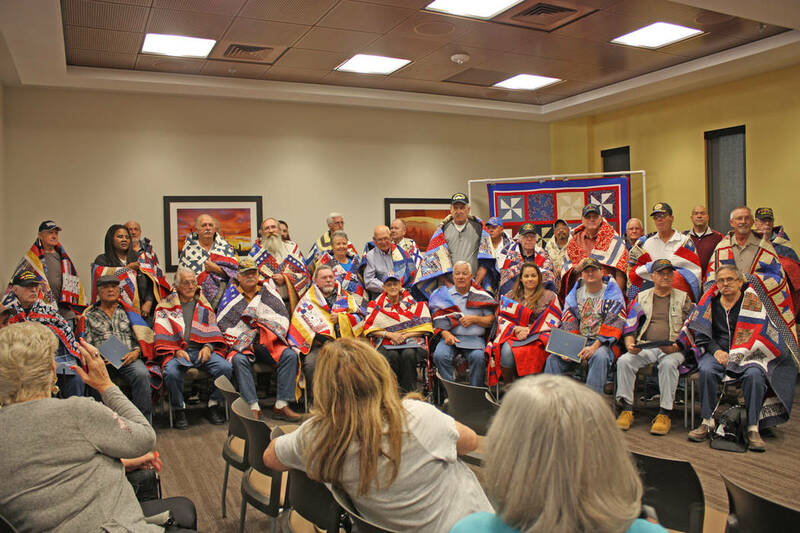 Robin Hebrock/Pahrump Valley Times The entire group of veterans receiving quilts of valor gathered together for photos to cap off the presentation ceremony. 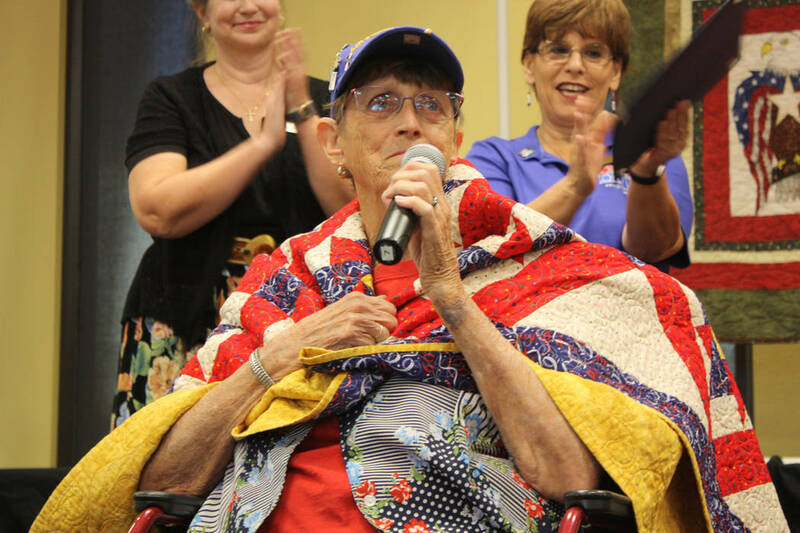 Robin Hebrock/Pahrump Valley Times U.S. Air Force veteran Pam Raneri is pictured draped in her new quilt of valor, an honor she was obviously pleased to receive. Her husband Phil Raneri also received a quilt during the Nov. 3 presentation ceremony. Well, for the Nye County Valor Quilters, the answer is an awful lot of love and appreciation, along with months of hard work and creative expenditure, all in the name of honoring those who have served in the U.S. Armed Forces. 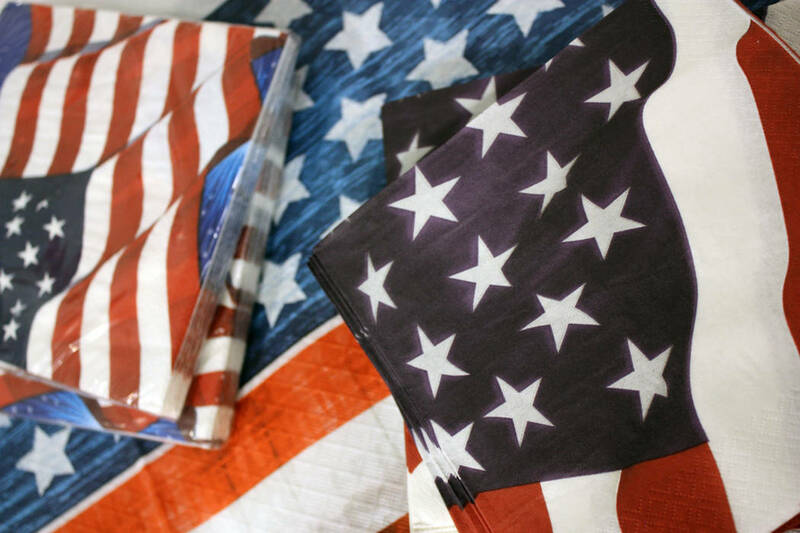 The mission of the Nye County Valor Quilters is to bestow one of their quilts of valor to as many Nye County veterans as possible and thus far, hundreds of the soft, handmade creations have been given to those who have served and sacrificed. 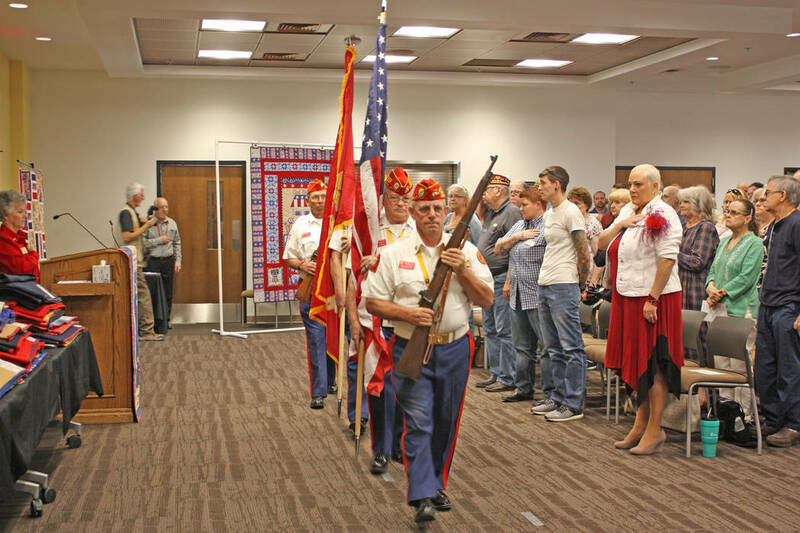 On Saturday, Nov. 3, another 34 Nye County veterans were presented with their very own quilts in a touching presentation attended by a large crowd of their friends, family and supporters. Former members of the U.S. Army, Navy, Marines and Air Force were included in the awarding ceremony on Saturday, which took place inside the packed venue of the Valley Electric Conference Center. Army veterans honored that morning included Edward Bartos, Jeffrey Bohn, Velma Chaffee, Ray Fineran Jr., James Kaszuba, Thomas Moler, Pete Quinata, Rebecca Shorb and Douglas Wolf. Navy veterans included Victory Becker, Richard Cooper, Charles Ertel, Larry Fried, Ronald Gitter, Merle Jenson, Paula Noot, Elmer Patrick, Thomas Pryor and Wayne Stevens. Those from the Marine Corps included Tom Edwards, Ralph Goff, Harold Hughes, Hans Korschinowski and Hector Marcayda. Air Force veterans included Alan Foshee, Kenneth Lindell, Pam Raneri, Phil Raneri, Robert Vaught Jr., Adam Warren and John Wise Jr.
Veterans Reginald Knight and Richard Huff Sr. were honored for their service in both the Army and the Marines while Ira Dulaney was presented a quilt for his service in both the Marines and the Air Force. Each of the veterans expressed their own gratitude for the kindness and thoughtfulness of the Nye County Valor Quilters, some lighting up with beaming smiles, others blinking back tears as they were wrapped in their quilts, tangible symbols of the love of all who had worked to craft them. The Nye County Valor Quilters is a charitable organization that depends on the generosity of its members and the community to fulfill its mission. Donations are always welcome and can be made via check to Nye County Valor Quilters, P.O. Box 3632, Pahrump, NV, 89041. Readers can also learn more about Nye County Valor Quilters, how to join and how to apply for a quilt of valor by contacting group leader Elba Rocha at 702-336-8918.